The new mechanical Ergopower Record™ 12x2 Speed Rim Brake controls are aesthetically pleasing and functional. 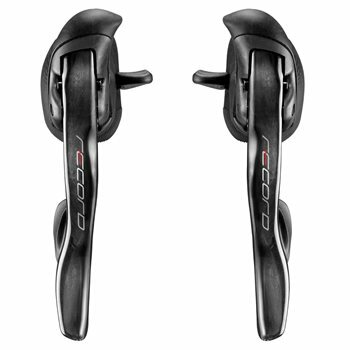 The new carbon unidirectional levers lend the Record Rim Brake controls an air of power, stiffness and reliability. These new controls allow riders to select two different lever-handlebar positions spaced to adapt to the size of the hand, whilst keeping braking efficiency constant. This is accomplished through the new angle of the up-shifting lever that prevents any possible contact with the curve of the handlebar. The Vari-Cushion technology offers an ergonomic, comfortable and safe support and grip. The “one lever-one action” feature assigns each lever one function to prevent shifting errors. The Ultra-Shift mechanism enables upshifting up to three sprockets at a time and downshifting a full five. The new Record™ 12x2 Speed Rim Brake levers introduce a double curvature to improve grip and thus safety. Comfortable support – Vari-Cushion - The controls enable a solid, safe grip when pedalling out of the saddle or gripping high on the handlebar. Rapid shifting - Immediate shifting engagement enables activating the front derailleur with minimum effort and in any hand position on the handlebar. Multiple action – Ultra-Shift - An unplanned ascent, a sudden accelration: it takes barely a moment to find the right ratio owing to the multiple action of the controls. Ergonomic - The shape of the body and the possibility to adjust the reach enable all cyclists to use these controls, regardless of the size of their hands or fingers. Brake lever with double curvature - Offers maximum safety from any position, due to both the curvature of the handlebar and the controls. NB - supplied with all necessary genuine Campagnolo inner and outer cables for installation.